Get your DMV registration card and sticker in 3 days instead of 3 weeks. 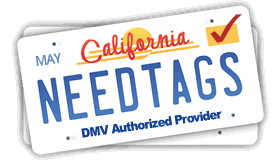 Enjoy the highest rated CA DMV registration renewal service on the Web. Get 20% off renewal services with the coupon code below. Instruction: Visit NeedTags.com and apply coupon code smogtips2019 at checkout. Enjoy same-day DMV card and sticker shipping to any address in the U.S. and FREE instant download of your new registration card! *Offer applies to NeedTags service/processing fees only. Copyrights © 2019. NeedTags logo is a trademark of NeedTags.com and its affiliates. All Rights Reserved.